The oxidization and reduction of chemical substrates reducing the algal growth would be useful tool for regulating the harmful microalgal biomass, and the iron deficiency would provide the physiological stress for the microalgal cells. The degradation processes of organoarsenic compounds in aquatic environments depend on microbial activities and significantly influence the arsenic cycles. 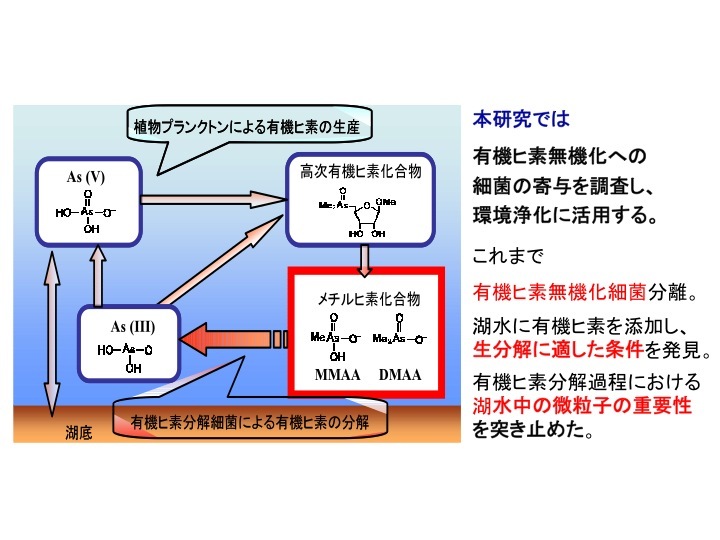 In Lake Kahokugata, inorganic arsenic was detected through all seasons, while dimethylarsinic acid (DMAA) appeared at only winter seasons, and monomethylarsonic acid (MMAA) was not detected. 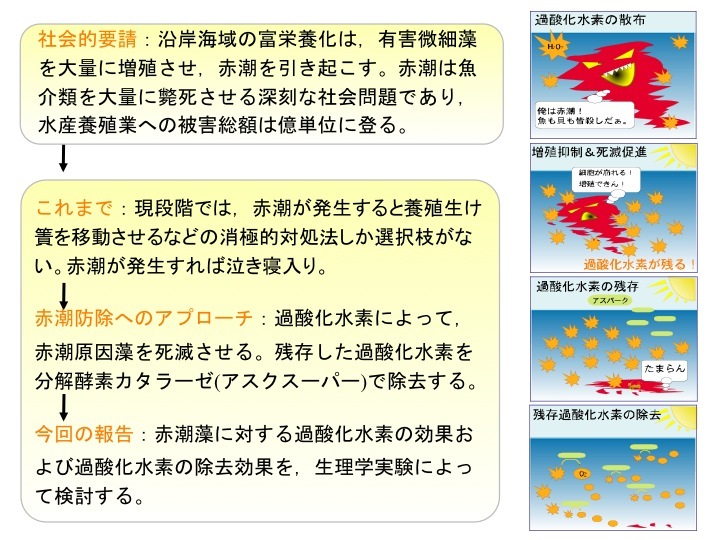 The Most Probable Number (MPN) procedure detected the DMAA-degrading bacteria. A large numbers of isolates of DMAA-degrading bacteria seasonally obtained were classified into some phylotypes of which compositions seasonally varied, by phylogenetic analysis of 16S rDNA. The dominated types at all seasons and winter seasons indicated high degradation activities, and phylogenetically belonged to the several bacterial species. 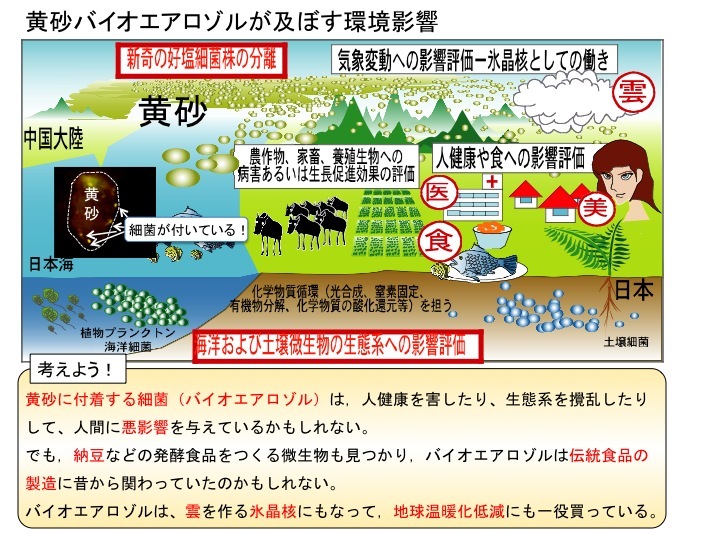 The seasonal similar activities of DMAA-degradation in Lake Kahokugata would depend on the several bacterial species of which compositions seasonally changes. Physiological characteristics of bioaerosol collected at the source area and the arrival areas of KOSA are investigated by physiological experiments. Moreover, the bacterial compositions including halobacteria are estimated using the phylogenetic analysis of 16S rDNA sequences, and the biomolecular detection system for the long-range transport of microorganisms is evaluated for elucidating the effect of KOSA event on the marine ecosystem.